Samurai Warriors 4-II: is a hero-focused saga that casts a spotlight on the samurai that shaped the Sengoku era and tells their stories through 13 exciting new chapters. These chapters revolve around nine characters introduced in Samurai Warriors 4, three fan-favorites from previous titles, and a brand new addition to the samurai roster. 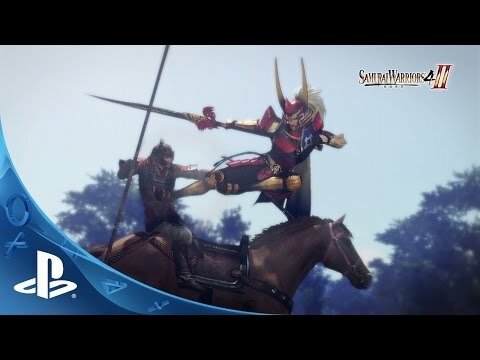 This game tells the tales left untold by "Samurai Warriors 4," and from the point of view of the characters themselves, rather than the previous title's focus on the various regions and clans of the time. Drawing upon some of the new characters introduced in "Samurai Warriors 4" as well as other popular characters, this title depicts the stories of these characters, enabling players to experience the untold stories behind the drama of the era. In addition to the exhilarating battlefield gameplay that the series is known for, even more strategic elements have been added to make the gameplay more tactical than ever before. From Hyper Attacks being ineffective while in red zones to an increased emphasis on morale and improved AI patterns for enemy soldiers and officers, a greater focus on tactical gameplay has been added to all areas of the game. Furthermore, the event scenes that are the backbone of the story, along with the background environments, camerawork and effects have increased the dramatic aspects of the game to allow for a story with even more passion and depth. ©2015 KOEI TECMO GAMES CO., LTD. The KT logo is a registered trademark of KOEI TECMO HOLDINGS CO., LTD.